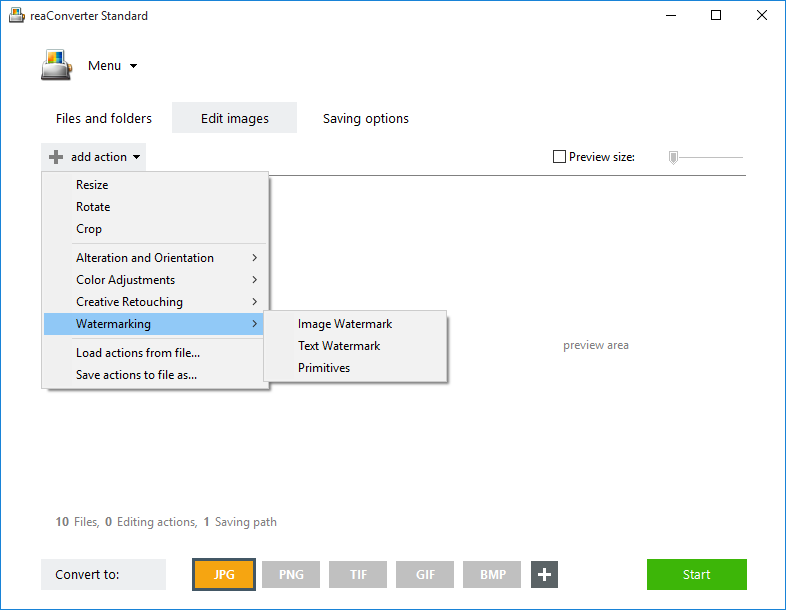 reaConverter allows you to apply image and text watermarking to large groups of photos in a matter of seconds. Additionally, this powerful software supports dynamic watermarking, which involves a watermark text that differs from one image to the next. 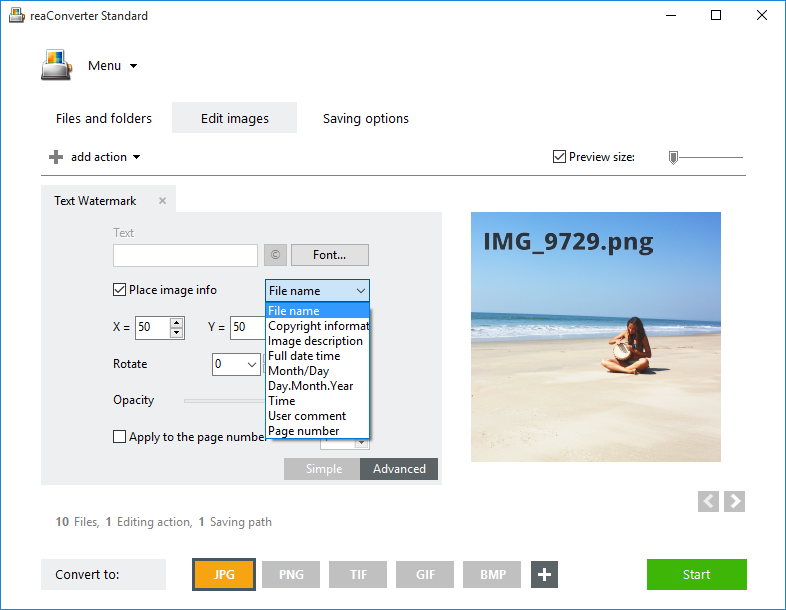 In case you have an entire series of photos that you want to watermark and you don't plan to use an identical text for each of them, reaConverter allows you to place customizable image info on each photo. You can opt for inserting the image file name as watermark, its copyright information or image description, the full date and time when the photo was taken, as well as several other different details connected to each different photograph. Load one or more images you intend to watermark. Use the available drag-and-drop tool or select the images manually from the desired locations. Instead of inserting a single text that will appear on all images, tick the Place image info box. You will then be able to select from a dropdown menu what info you would like to see on each image. Available options include the file name, the date and time, image description and several others. In this window you can also adjust the position of the watermark text by setting its coordinates, using pixels or percents. Plus, if you go to the Advanced section, you can adjust the opacity of the watermark text and rotate it to a customizable number of degrees. Finally, go to the Saving options and decide on a local or online location for your newly watermarked images. 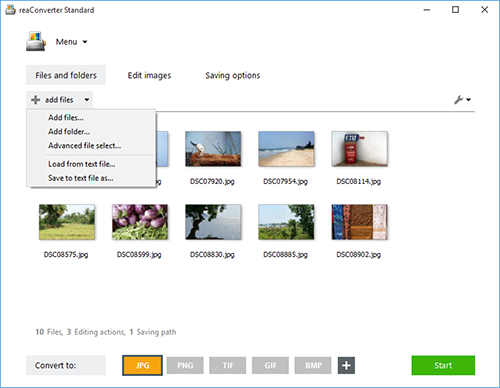 Here you can also opt for converting them to a new format, out of the comprehensive list of image extensions supported by reaConverter. Simply pick one of the buttons from the lower part of the screen and Start the editing and conversion process. 8. Font style (Syntax: b, i, u, s) where "b", "i", "u", "s" mean bold, italic, underline, strike. Command-line dynamic watermarking tool is an advanced feature meant for professional use, and is available in Pro edition only.